With its weekly yoga class right on campus, in fact right in Munro Parlor, named after the first dean of the college, Eastern Nazarene College continues to commit serious error in identifying itself as a “Christian” school. I have written much in the past about my alma mater and its embrace of false teachers, its support of professors who promote evolution and open theism, its compromise with homosexual activism, and its ecumenicalism. The school is yet again reaching out into the world and bringing in not only what is a worldly practice, but a practice that teaches pagan spirituality, delves into dangerous use of mysticism, and leaves a Christian open to spiritual deception. Instead of following the biblical command to “be not conformed to the world”, the school continues to reject almost every sound biblical principle taught in Scripture. The word yoga means “union.” The goal is eventually to unite yourself with the infinite Brahman, which is the Hindu concept of God. That concept is expressed as the belief in “pantheism”, that everything is God. Because everything is God, therefore there is no difference between man and God. The origins of yoga are clearly anti-Christian, and its emphasis is on teaching a person to focus on one’s self rather than focusing on God. So one of the goals of yoga is to teach you spirituality, or help you find your spirituality. It teaches that there is a divine light within each of us. All of the yoga postures represent a specific spiritual meaning, and although I will not go into details of these postures, you can research for yourself and find out that yoga is far more than physical exercise, and why it is to be avoided by all Christians. Several years ago my wife and I met with the president of ENC, Dr. Corlis McGee, as well as the school chaplain and the provost. Although we had a cordial conversation with them, we were miles apart in our beliefs. 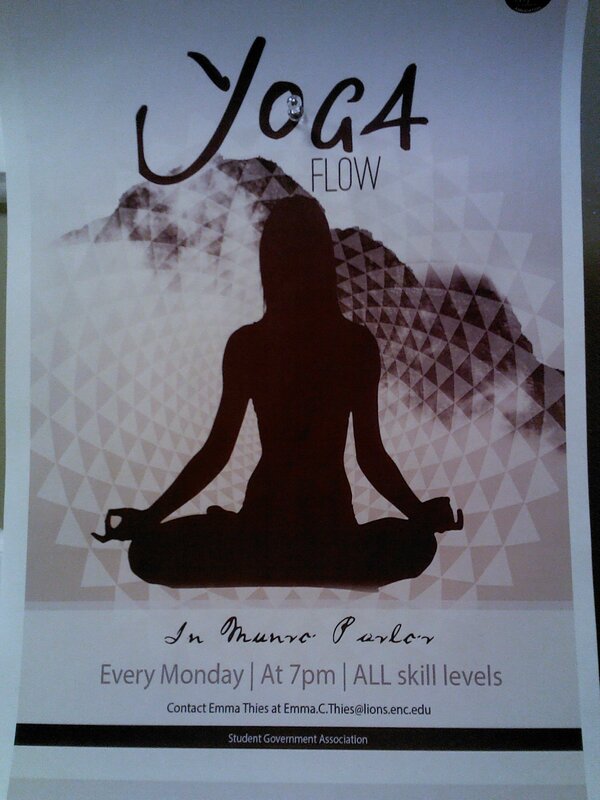 It is certainly no surprise to me that yoga is now allowed on the campus. We had gone there to voice our objections to the scheduling of Tony Campolo to speak to the students at chapel services. Dr. Campolo is an advocate of contemplative mysticism, and he confirmed our concerns when he spoke the next month, unashamedly promoting mantra prayers (centering prayer) and occultic Celtic spirituality. As I looked around and noticed several pastors in attendance, I wondered whether any of them had any idea of the harm this man was potentially causing to students listening to him. Lack of discernment in the Christian colleges today is no longer a rare thing, but a common occurrence. There is not one Nazarene Christian college, and very few other Christian colleges, that has not been affected in one way or another by these false teachings and the ecumenical philosophy that is plaguing these schools. It would be much better for a Christian student to attend a secular college, than to attend and support a Christian school today in name only. While proclaiming faithfulness to the truth of Scripture, schools such as Eastern Nazarene College have become nothing but havens for compromise. ENC proudly proclaims the statement, attributed to Bertha Munro herself, that “There is no conflict between the best in education and the best in our Christian faith.” And in doing so, they have no problem allowing evolutionists to confuse the minds of their students, and allowing other doctrines of demons to be taught to the students. Instead of strengthening the students’ faith with the truth of Scripture, they promote the liberal mentality of “let them come to their own conclusions” by exposing them to all sorts of false teaching. We are told by Paul in Romans 12:2 “Do not conform to the pattern of this world, but be transformed by the renewing of your mind. Then you will be able to test and approve what God’s will is–his good, pleasing and perfect will.” Yoga is a worldly practice that does not reflect the mind of God. Practicing Eastern pagan meditation is not part of God’s “perfect will.” The practicing of yoga will leave the Christian wide open to deception from satan. (Be sober-minded; be watchful. Your adversary the devil prowls around like a roaring lion, seeking someone to devour. 1 Peter 5:8) Instead, all that we do, we should do for the glory of God (1 Cor. 10:31). If yoga is truly okay for Christians, then why not also use Ouija boards, Tarot cards, Astrology signs and symbols? Like yoga, they all have a philosophy and idea behind them that makes it a problem for Christians to justify. Yet somehow yoga has passed the smell test at many “Christian” colleges and churches, and is now practiced by many undiscerning Christians, encouraged by pastors and other leaders who are also blind to the truth. But such is the sad state of the “Christian” college today. Many Nazarenes, including myself, do not recommend that parents send their children to any Nazarene college at the moment, including attending the seminary, which also promotes contemplative spirituality and occultic Celtic “Christianity.” I sent an email to President McGee on March 27, asking her to explain why this is being allowed, and if the school is approving of this practice. I have not yet received a response. In what direction is Eastern Nazarene College heading? I attended ENC back in 1973-1976, although I did not graduate, having transferred to Barrington College and finishing there. I have some fond memories of my time at Eastern Nazarene College, and I became a Christian while attending a service at the Wollaston Church on campus when I was a teenager. Dr. McGee, is ENC promoting Roman Catholicism, the emergent church movement, contemplative spirituality, Open Theism, and Process Theology? I have been quite concerned for some time about changes that I have noticed happening in our Nazarene denomination, and especially in our universities. I am writing to see if I can get some feedback on these concerns, which are shared by many other Nazarenes as well. We love the Nazarene denomination and what it has meant to us over the years, which is why we are trying to get some direct answers from our leaders in the schools and our denomination. I believe we are owed at least a clear answer as far as the direction of the school. Some of these issues could seriously affect the long term success of the school as a Nazarene sponsored institution. Many of us believe that any university or college bearing the name Nazarene should adhere to the same principles that the Church of the Nazarene teaches, and if not, then why have the name Nazarene? Personally, I would not send my son to ENC at this time if he was old enough. My recommendation to anyone else who is planning to send their child to ENC, is that they ask plenty of questions first and find out what direction is it that ENC is heading towards, and where it stands on such matters as the emergent church movement, contemplative spirituality practices, and open theism. Seeing how some of the other Nazarene universities have moved into practices that are either not biblical or very dubious at best, nor are reflective of our Wesleyan-holiness tradition, I am very concerned for the future of Eastern Nazarene College. Rob Bell’s Abstract Elvis, Rob Bell: A Modern Day Gnostic, Rob Bell: More Messed Up Emergent Ideology. If you don’t know Rob Bell, any of these posts will show you why I am so very concerned that his books are in the ENC bookstore. Another book is PostModernism For Youth, with contributors like Brian McLaren, Leonard Sweet, and other emergent authors who have dubious ideologies at best. In fact, many of Brian McLaren’s teachings are clearly false, and I believe he has shown us that he is a false teacher, based on his very words. If you read some of his positions on scripture, such as the blood atonement of Christ, and his views on eschatology, hell, and other core doctrines of the Christian faith, you cannot come to the conclusion that he is a good influence for our ENC youth. Although we have not heard much from the General Superintendents regarding the emergent church, they have themselves strongly criticized his teachings recently. I also saw several versions of the Roman Catholic Bible, including one with a bonus rosary inside. Why are these being sold in a Nazarene bookstore? Surely you are familiar with the many false doctrines that are promoted by the Roman Catholic church. If not, I recommend you read the following link for a summary of the official Catholic church teachings, and how the RCC has been brought into evangelicalism in many ways: Roman Catholicism and its Heresies, and here is a video by Richard Bennett, a former RCC priest Roman Catholic Mysticism and the Emergent Church. There were quite a few other books that disturbed me, but I hope you can understand my concern just from these few I mentioned. I am not sure if there are books there written by Nazarenes or authors from our holiness and Wesleyan tradition, but I would hope there are, instead of books by Bell, McLaren, and others of the emergent-contemplative spirituality philosophy. How can listening to heretical teachings, for example, that says that the bread and wine become the actual body of Christ, help someone grow in their faith? This belief, called transubstantiation, is seen by the RCC as a “re-sacrifice” of Christ, when the scriptures clearly teach that it was a “once for all” sacrifice (Hebrews 10:10, 1 Peter 3:18, Heb. 7:27). This official Catholic teaching does not hold up to scripture- that the wafer and wine become the actual body and blood of Christ. John 6:54, often quoted as justification for this teaching, does not support it. The Bible declares that the Lord’s Supper is a memorial to the body and blood of Christ (Luke 22:19; 1 Cor. 11:24-25). It is not the actual “eating” of Christ’s body and blood. Jesus had not yet had participated in the communion supper with the disciples, in John 6. He instituted the Lord’s Supper later on. This is just one example of many false teachings. I pray that not a single Nazarene pastor or theology professor is teaching this and other heresies in their church or their school as acceptable Christian doctrine. Let me make it clear, I do not have a dislike, hatred, or disdain for Catholics or anyone for that matter, and I do believe there are probably individual Catholics who are truly saved, in spite of the official doctrine of the church. I am talking about the official organization and its dogma. So here is another question: is Roman Catholic teaching and doctrine in accord with scripture and with Nazarene teaching as a holiness denomination? Why would we want to steer students to a Roman Catholic church when much of its teaching is indisputably false and heretical? I’m sure some students will decide on their own to find one, but should we list them on the ENC website, thereby giving some kind of tacit approval as if the RCC believes and teaches the same as the Nazarene church does? I had to scroll down to the bottom of the list before I could finally see our own Nazarene churches listed. There are a whole bunch of churches listed first, including some other churches of which I don’t know what they exactly teach also, and Nazarene churches are last! 3. Lecturers at ENC. I was concerned last year with the hosting of Dr. Tom Oord of Northwest Nazarene University for a lecture at ENC, and I know that I am clearly not alone amongst other Nazarene parents and supporters. Dr. Oord is a proponent of Open Theism, a heretical teaching that says God cannot clearly know the future and thus denies His sovereignty. At his lecture, when I pointed out to him that sin and death came to the world through the sin of Adam, he clearly disagreed with me, even though the scriptures plainly state that fact, and I believe the apostles and Jesus Himself referred to Adam and many other Old testament figures as actual historical figures, and not allegory. ENC also helped sponsor a seminar on Open Theism a few years ago, with the support of Dr. Karl Giberson, a science professor at ENC. Dr. Giberson believes that evolution is compatible with Christianity, even though it contradicts the biblical account of creation. He has recently called creationists “cult members”, in an article at USA Today, as mentioned at Sola Sisters blog. You will find that there are many Nazarenes who take exception to his teaching and his obvious disdain for Christians who dare to believe the biblical account for what it says. I’m sure someone will complain and say that I am taking Dr. Campolo out of context. Perhaps then, if he does come to ENC in October, someone could ask him to explain to our students what he actually means by these statements? There is a whole lot more I could tell you about his ideology. But the question is this: if ENC leadership is well aware of what I have stated about Dr. Campolo, does this mean that they are supportive of speakers with his kind of theology? If you are not aware of what he is all about, then I recommend finding out more, and suggest that you could find speakers for the students to listen to, who are more in line with solid Christian doctrine, rather than dubious theology and practices. I believe those who might have a possible future invested at ENC for their children, have a right to know on what basis does the leadership at ENC decide who is to come and speak to very impressionable students in chapel services. From my research, it is clear that Dr. Campolo is closely connected with Brian McLaren and others who push the emergent church agenda. I have more concerns that I would like to share later. I know that as the College President, you most likely do not directly oversee book selections at the bookstore, but I thought it was best to bring this directly to your attention and ask if you, the instructors, or the school chaplain approve of these things. My goal is to help in the best way I can, to keep Eastern Nazarene College focused on reflecting the same principles, ideals, and doctrinal stances of the denomination of which it bears its name. Should you have the time, I would be glad to meet with you personally to further discuss additional concerns.